A splendid addition to your garden, that can be trained against a wall, or be grown in a large pot. The mulberry is a handsome plant even when quite small, bearing heart shaped deep green glossy leaves which turn to a golden yellow through autumn. Growing your own is usually the only way to experience this delicious tart berry which is enshrined in folklore as they are rarely if ever seen in the shops. Supplied as bare root tree 60cm tall. 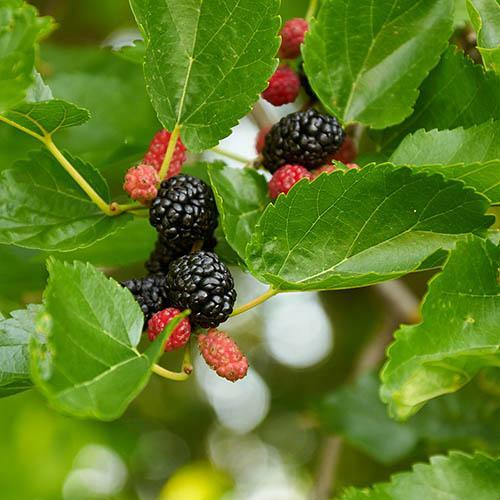 Although a native of SW Asia the Black Mulberry has been a feature of British gardens and parkland for centuries. It'll make a splendid addition to your own garden, eventually forming a medium sized spreading tree but can also be trained against a wall, either way it like a sunny spot. It can also be grown in a large pot for a dozen years or more before it needs planting out. The mulberry is a handsome plant even when quite small, bearing heart shaped deep green glossy leaves which turn to a golden yellow through autumn. Once the tree reaches four or five years you can expect the first crops of juicy succulent mulberries which are delicious and well worth the wait, growing your own is usually the only way to experience this delicious tart berry which is enshrined in folklore as they are rarely if ever seen in the shops. Berries are best harvested when really ripe when they can be shaken from the tree onto a sheet on the ground. Mulberries make sumptuous jam and pies. Gentle pruning is only necessary to maintain a good shape and this should be done in winter when the tree is dormant. Supplied as bare root tree 60cm tall, ready to plant out.